Packing for your villa holiday can be stress free, whether you are taking charge of packing for travel with adults, toddlers, or even a family of four. Following our top tips will ensure you get organised, make the most of the suitcase space, stay within the weight limit for your baggage, and still bring everything you need for your holiday. For all of you that suffer from the quandary of where to start and what to pack for your holiday we've teamed up with avid traveller Monica founder of The Travel Hack to help. Here are her fantastic quick wins and great advice for making packing a suitcase just that bit easier. A packing list is going to help you remember everything. It also means you can pack faster, and you'll spot anything you need to buy before you go to avoid panic buying things before you leave, or paying extra for things at the airport. Write your packing list on your phone so you've got a template for future trips that you can use every time you go away! Realistically we don't need any of those 'just in case' items that we always take along. That extra outfit, the extra bikini or pair of shoes - they never get worn, so just leave them at home and stick to the things that you really need. If you are staying in one of our villas you'll probably have a washing machine so you'll be able to wash any clothes if you do run out. Laying out all of your clothes and arranging them into outfits will help you see what clothes go together, and spot if there are any items in your case that don't match anything. Maybe you've got a top that doesn't go with any bottoms, or a pair of shoes that just don't match any jeans - leave this stand out item at home and avoid wasting space in your suitcase. You probably don't want to spend your whole holiday ironing. There are some trips where packing clothes that do need ironing is completely unavoidable, especially for men who might like to take smart shirts. If this is the case then roll the shirt really gently instead of folding, and as soon as you arrive in your destination hang it up and place it in the bathroom where the steamy shower will help loosen the creases and make it easier to iron. Stuff sacks, packing pods, or packing cubes as they are sometimes called, will keep your suitcase nice and organised. If you are sharing a case with someone else it means you can have a packing cube each to keep your things separate. You could have one for your tops and one for your bottoms, one for underwear, and one for accessories - keeping your suitcase nice and organised. Shoes are bulky and take up a lot of space, and more often than not you don't wear half of the pairs of shoes you have taken on holiday. Take 2 or 3 pairs including the comfortable flat shoes that can also be worn on the aeroplane, one pair of evening shoes that are dressier, and one pair of flip-flops for everyday wear that hardly take up any space in the suitcase. 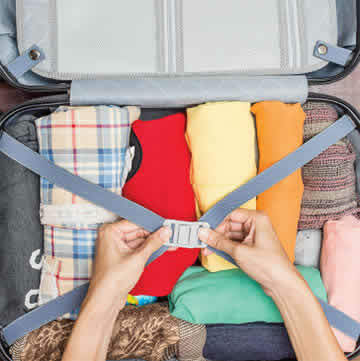 Squeeze everything electronical in the gaps between your packing cubes so it is nicely contained. The packing cubes will keep everything protected so you don't have to worry about your items getting broken. Weigh your suitcase before you leave the house. Avoid that embarrassing moment when you get to the check in desk and they tell you your bag is overweight so you either have to pay extra to check the bag in, or you have to take the bag aside to remove heavy items - especially with a queue of people watching you as you do it!